This roasted sweet potato recipe is a dish you can make not only with Mexican food but anytime. Our recipe includes a variety of spices and flavorings and a little heat. Feel free to adjust this part according to your taste. We will be roasting this recipe in olive oil which gives the potatoes a delicate caramelized flavor. When they are almost done we will brush them with our honey-lime glaze and sprinkle with fresh cilantro. When selecting your potatoes, look for those on the small to medium size with no bruises or cracks. The real large ones tend to be more fibrous and not as sweet. Some of the more common sweet potatoes you will find in the grocery store are Garnet, Jewel and Beauregard to name a few of the seven major varieties. Did you know that the sweet potato is part of the morning glory family and not related to the yam? In a bowl toss the sweet potatoes with the olive oil. Using your fingers, sprinkle the chile powder over the potatoes. Stir and repeat the process. This will help spread the chile powder evenly over the potatoes. Pour onto a baking sheet and spread them out. Use a rubber spatula to scrape out all the oil. The oil will help keep the potatoes from sticking. Salt to taste. Bake for 20 minutes. Check the sweet potatoes after 10 minutes and turn them over. If they start to stick, you can pour a drizzle of olive oil over them. I love using the stoneware from Pampered Chef for this dish and any vegetable roasting recipe. Food usually doesn’t stick and it’s not made of teflon. Teflon and high temperatures are not a good idea. This stoneware also does an excellent job of keeping your food warm after it’s done cooking. 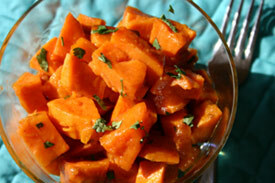 While you are roasting sweet potatoes, mix the glaze ingredients in a bowl with a whisk. When the potatoes are done, brush on the glaze mixture and return to the oven for an additional 5 to 10 minutes. Place in a serving dish and sprinkle the chopped cilantro over the roasted potatoes and serve. Store your sweet potatoes in a cool, dry place between 55 to 60 degrees F. They will keep for up to one month. Don’t even think about storing them in the refrigerator. The inside will harden and their taste will be affected. Rinse them only right before you plan to cook them. Once you cook them they will keep about 1 week in the refrigerator. Here is a tip: This sweet potato recipe freezes well so make up a dish a head of time. When you are in a hurry or don’t have enough time to cook, you’ll just have to pop them out of the freezer and heat them up. Sweet potatoes can be flavored with a number of other items such as pineapple, oranges, raisins, toasted walnuts, sunflower seeds or pecans. Want to add some spicy hot to this recipe? Try substituting ancho chile powder or chipotle chiles. Also good is cloves, nutmeg, ginger, maple syrup, rum, balsamic vinegar, or coconut. So you see, sweet potatoes are very versatile and very good for you. Did I mention they are loaded with vitamin A, C and dietary fiber? So the next time you are whipping up some Mexican fare, try this Mexican sweet potato recipe with some carne asada. and a margarita. ole! I’m sure you will love the flavor. Looking for more vegetable recipes?